Heather pays a visit to Socks' former owner and learns an important lesson in the process. This month, I found myself with a rare spare weekend. Of course, it didn’t stay that way for long. I’d always said I’d take Socks back to visit Tina, the lady we bought her from, so she could see how we were getting on. Tina evented Socks before I had her, so it’s always been a bit of a thorn in my side, knowing that Socks can and has done it - obviously, I’m the problem. But more on that later. Tina had a spare space in one of her jumping clinics, so I thought, why not? Off we went to Socks’ old competition yard, only slightly worried that Socks might think we were giving her back. Happily she was just as chilled and up for it as she usually is! The first thing Tina said when she saw Socks was: “Wow, look at her top line!”. I was immediately thrilled. She was really pleased with how well Socks was looking, and how chilled she was as well so Mum and I gave ourselves a big old pat on the back for that! There were a range of fences in the arena, including Socks’ arch nemesis - a water tray. But this time, her reaction was completely different. Instead of spooking at it from 10 metres away and refusing to go anywhere near it, she was drifting toward it. Almost as if she wanted to jump it. So who was I to refuse as she’d asked me so nicely? Obviously, Socks had never had a problem with water trays, and I’d been maligning her dreadfully. (All lies. She’s dumped me on the floor in front of them more times than I can count.) Still, progress is progress! We had an absolutely fabulous lesson working over different distances and I had a bit of a breakthrough about balancing speed and impulsion when we’re showjumping - there's a golden balance and I’m getting better and better at finding it! We were discussing what my competition plans were and I mentioned that I was going to event Socks this summer (we have our first one booked for May - eeeeek!!) and it was here that I had a major realisation. Tina asked me if she had evented Socks, because it was six years ago and she couldn’t remember, and it hit me - I’ve been holding myself against an entirely imaginary ideal for the last six years. I had it in my head that I had a horse that had evented, and I was failing her if I didn’t do the same. While yes, she had evented and placed, no-one ever had any expectation that I had to do that too. Of course I wanted to, and I plan to - but how much quicker would I have got to where I am now if I’d just taken that pressure off myself? I’ve been thinking far too much about what other people will think about how good a rider I am or how talented Socks is and really, it doesn’t matter one little, tiny bit. My horse is happy and healthy, she looks fab and we’re having a whale of a time together. Any other successes are added bonuses. 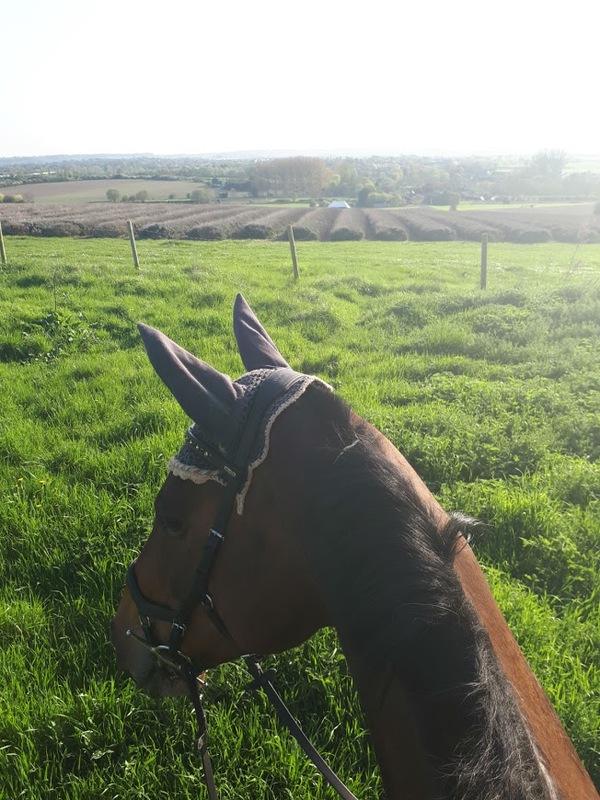 Socks and I enjoying a beautiful sunny hack around the lavender fields local to us - does it get any better? Honestly, I’m kicking myself for not realising this sooner. Although people had said as much to me, it hadn’t ever properly registered in my mind.